El Varon and LLIPA Projects have shown large mineral deposits in the early exploration stages. By focusing our mining operation in a fairly concentrated geographical range, NILA has the ability to streamline its operations and provide efficient infrastructure for producing precious metal commodities. By focusing our mining projects in a fairly concentrated range of mineral resources in Peru, Nilam Resources has the ability to streamline its operations and provide efficient infrastructure for producing precious metal commodities. LLIPA project is located in the center of Peru, in Llipa district. 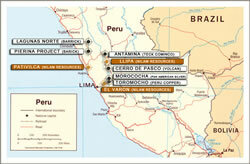 The mining operations are 380 km away from Lima, the capital of Peru. LLIPA is constituted by two major mining concessions, The Prospera mine and La Prospera XXI. El Varon is an ex-mining project that was closed 20 years ago due to sudden passing away of the previous owner. The most recent laboratory analysis has shown mineral deposits rich in gold, silver and copper metals.